When I looked it up on the internet last night Romanshorn looked like a nice place to stay but the reality of a hot sweaty room overlooking the railway station didn't quite live up to the billing. Really annoyed with myself because I hovered around a Gesthof about 90 minutes from my planned destination which was on the beach, didn't look expensive and had internet access. I could have gone for a swim. As it was I ended up staying in my second hotel on this trip which feels like it's in the hands of bankruptcy administrators. Staffed laid off, no real restuarant, a skeleton service. The other thing I discovered on the internet last night is that the town/city of Konstanz (Constance in English), which I thought I was going through today, is actually in Germany. Most people presumably know this but for some reason it was a surprise to me. According to Wikipedia it left its lights on in the second world war and wasn't bombed as a consequence as bomber pilots, like me, also thought it was in Switzerland. 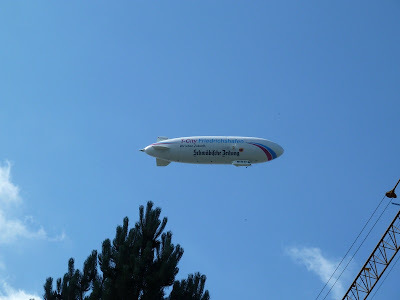 The final piece of slightly weird serendipity is that the Zeppelin airship designer was born in Constance and there was an airship flying overhead today. 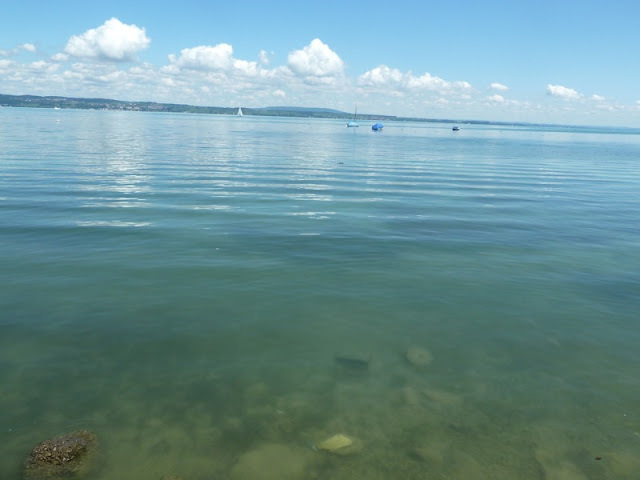 You can see the sort of thing that was going through my mind today as I was plodding along, mainly along a footpath along the side of Lake Constance, occasionally inland through a town, and sometimes through a campsite amongst the sunbathers. 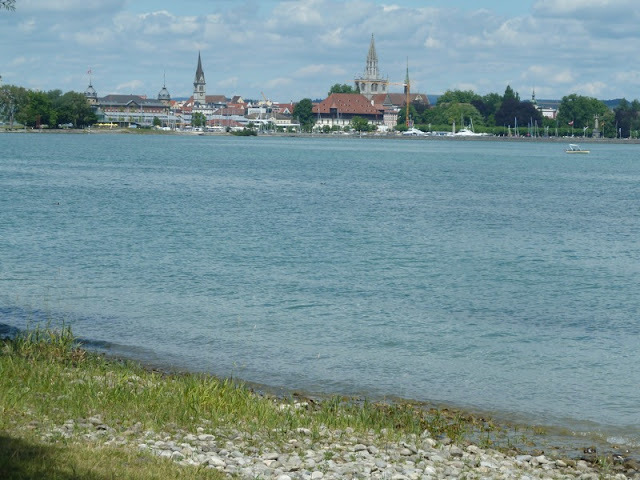 Apart from avoiding the sunbathers, the biggest diversion was around the southern Swiss suburb of Constance (known as Kreuzlingen) and past the fairly informal border crossings into Germany. Again the signs were brilliant and for once a big conurbation failed to present any navigational challenges. So really a coastal walk but nicer than the last coastal walk I did along the Costa Dorada. Definitely a better class of architecture. Saw my first robotic lawnmower, thought this was amazing, but then saw another two in short order. Now suspect that like the national location of Konstanz the existence of robotic lawnmowers is well known to everyone apart from me. 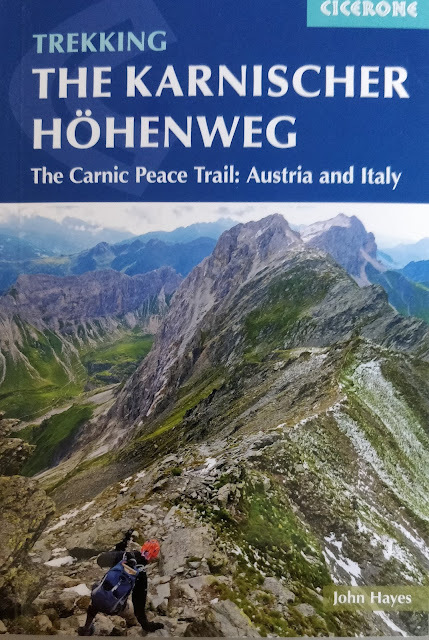 Ended up walking 30 kilometres and what with the heat and hard surfaces my feet were seriously complaining by the time I got to the nearest thing to inner city I've seen in Switzerland. Hard to sustain this impression given Romanshorn's lakeside location and the views of the mountains which, to the east, are starting once again to become prominent. Perhaps to hold onto it just a bit longer, and avoid the pizza the administrators at the Hotel were offering, I went to another establishment and had my first kebab since leaving the UK. Very nice but not a touch on the kebab you get on the Seven Sisters road on the way to watching the Mighty Spurs.